I wanted to post a couple of outfits from Friday but I’m going to have to apologise in advance as, as the photo of the outfit I wore to work was taken at the very beginning of the day and the outfit I wore to dinner at the very end, I’m afraid the light is not great in either. One of those ‘looks fine on the camera, looks terrible on the computer screen’ situations I seem to find myself in with outfit pretty much all of the time! I wish I could work out a way to improve them. Ho hum. Anyway – I wore this outfit to the office on Friday. Shirts/t-shirts and high-waisted skirts with a waist belt are fairly standard fare for my office outfits; I feel they’re a good smart/casual mix and high waisted skirts are a flattering shape for me. You may remember the H&M necklace from my last post – I was desperate to wear it to work as soon as I’d bought it but I’m still not 100% sure that under a standard shirt collar is the best way to wear it. How would you wear it? When I got home from work on Friday we had to get on the road as soon as possible as we were going to Weymouth for the weekend. 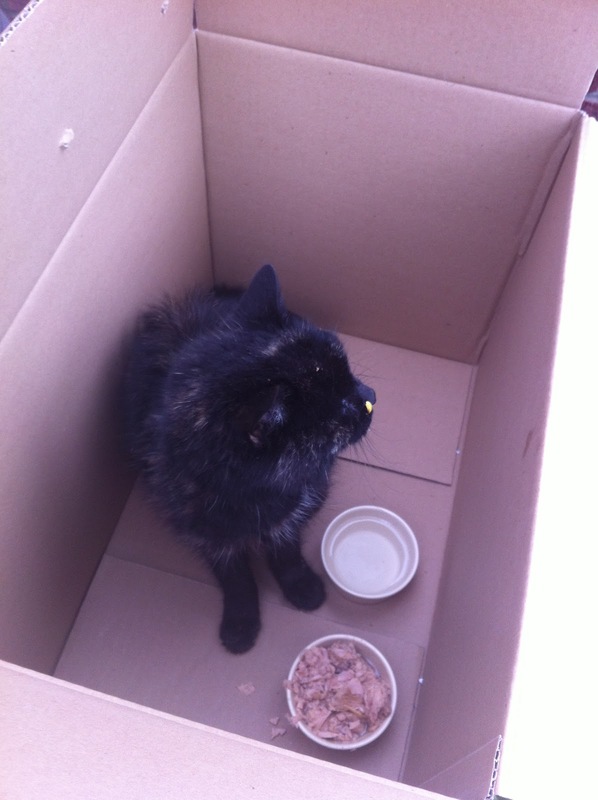 Unfortunately there was a somewhat unplanned element to our arrival home as there was a very poorly, skinny, scared cat on our neighbour’s drive (not their cat) and we decided to call the RSPCA so that they could get it and look after it. We gave it some food and water and they collected it whilst we were away. I think Tom had visions of us setting up a sort of animal hospital and we were both a bit sad to have to leave it behind. Does anyone remember the dove we looked after about a year and a half ago? When we got to Weymouth I quickly got changed into this outfit to go out for dinner and drinks with some friends. It’s a shame the light is not great as I love these new leggings – they are these leather panel leggings from Missguided [£11.99]. I got them last week and I love them; they’re ideal for smartening up an evening outfit. We went to a place called The Stables in Weymouth Harbour as we’d been there before for a drink but wanted to try their food. They sell pizzas, pies and cider – lots of cider. 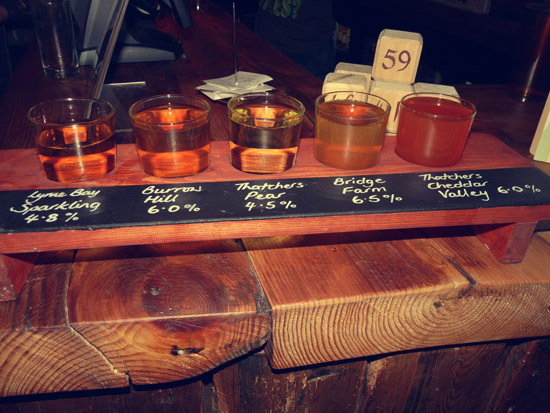 I tried their ‘cider tasting board’ which was £7.50 and means you can try five of their most popular varieties. The Lyme Bay was my favourite. I had a blue cheese, potato and onion pizza but it was pretty underwhelming so it was lucky the cider was so good! On Saturday we walked the dog along the beach and then went to see Avengers Assemble. It was pretty good though perhaps not ‘THE BEST FILM EVURRR’ like some people are saying. It was a good easy watch though and we raided Tesco’s before and took in a whole picnic of snacks which made it infinitely better. Today my plan was to get all the gardening done I’ve been meaning to do for ages (I have a stack of seeds about half my height that need planting) but sadly it is absolutely pouring down again so that seems off the cards. We have an online food delivery coming later and I am currently doing less Jenny Craig every week to prepare for coming off it permanently so I think I’m going to nose through my River Cottage Veg book (£14 on Amazon – bargain!) and dream of the yummy meals we have planned this week. Would you ladies be interested in me posting recipes up here or is that not really your thing? In the last couple of weeks I’ve made falafel, a yummy frittata, coca cola chicken and whoopie pies and this week I have lots more lined up so if you like recipes (and photos of food) I’d be happy to oblige! Hope you’re all having a more exciting Bank Holiday than me, boo to the rain!